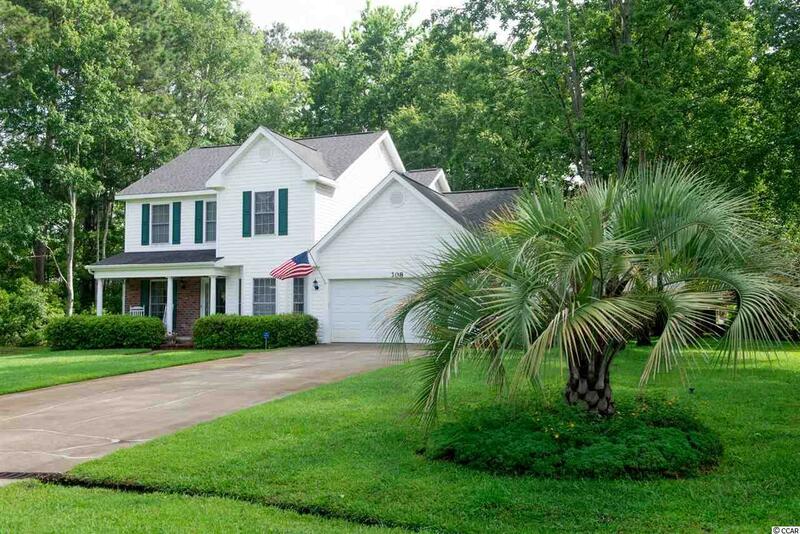 308 New River Rd., Myrtle Beach, SC 29588 (MLS #1904750) :: Garden City Realty, Inc. Private, Serene with great backyard! 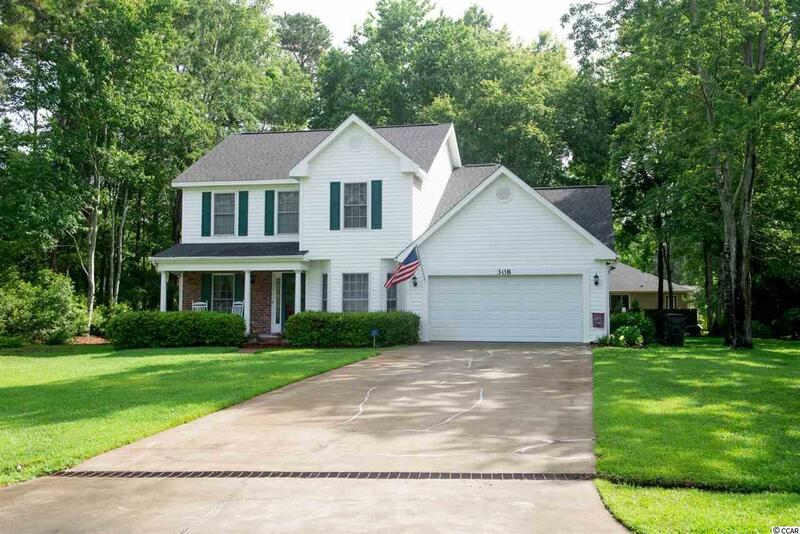 Lovely custom built 4 bedroom, 2.5 bath nestled in a cul-de-sac in the popular Lakes community. Situated on a large lot with welcoming front porch and great curb appeal. 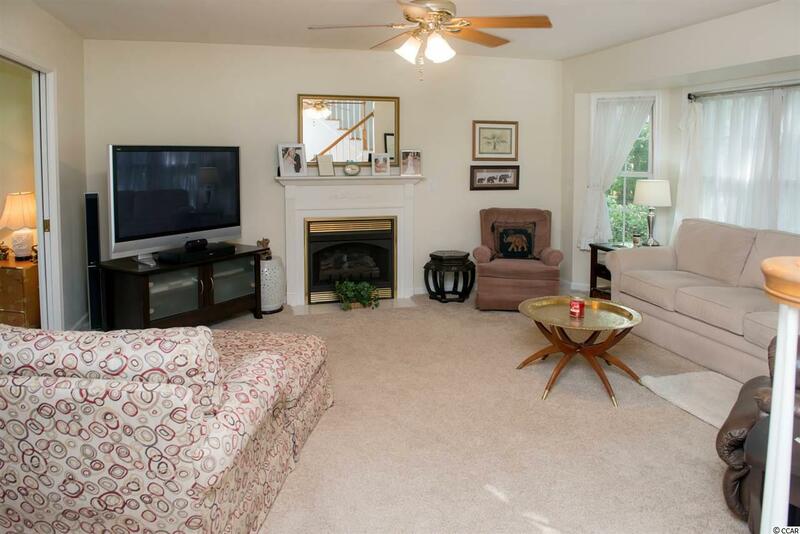 Entertaining will be easy in this well-maintained home with its two living areas a formal living room and separate family room, formal dining room and large backyard patio. Attractive laminate wood flooring in foyer, carpeting in living areas and tile in baths. 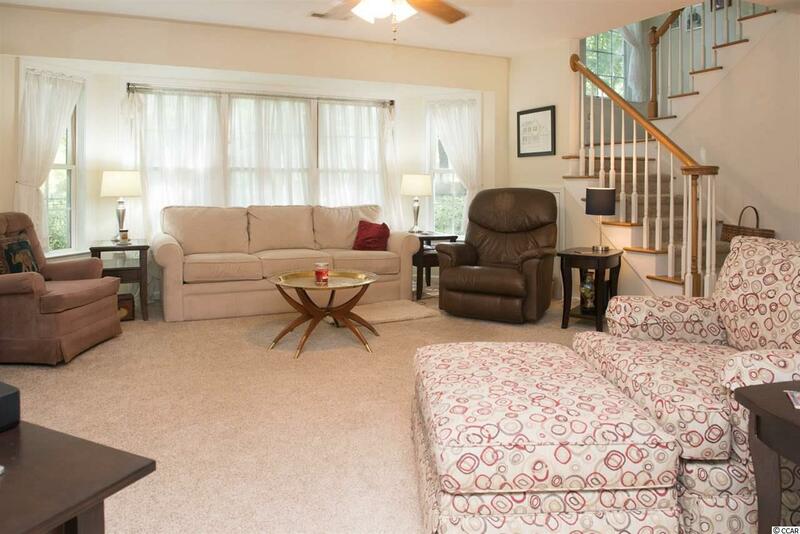 The living room features floor to ceiling windows overlooking the front and side yards. A pocket door from the living room flows into the family room with ceiling fan, propane fireplace and large bay windows overlooking the wooded backyard. Large kitchen with granite countertops, ceramic tile, pantry, built-in desk, lots of cabinets and counter space, breakfast nook and window overlooking the backyard. A formal dining room with custom chandelier, wallpaper, chair rail and crown molding will be great for hosting holiday dinners and celebrating special occasions. A half bath and laundry room with ceramic tile complete the 1st level. A pretty staircase with wood stairs and a large palladium window at the landing leads to the 2nd level which houses 4 bedrooms and 2 full baths. Spacious master bedroom with ceiling fan, walk-in closet and 3 windows bringing in lots of natural light. Master bath with tile, dual sinks, whirlpool tub, separate shower and linen closet. Three additional good size guest bedrooms and guest bath with tub and shower. Sliding glass doors from the kitchen lead to a brick and concrete patio overlooking a spacious and lovely wooded backyard. This will be a great spot to start your day, relax, enjoy the evening breezes or read a good book. Great backyard for grilling and entertaining family and friends. The wrought iron fenced backyard will allow your four-legged friends to roam and explore freely. 2 car garage with pull down stairs, floored storage in attic and door to side yard. Newer roof (2014-2015), new hot water heater (2018), newer dishwasher and garbage disposal, newer carpeting and termite bond. This home has great curb appeal with its cul-de-sac setting, lovely landscaped lot and large, peaceful backyard setting. Truly a wonderful family home, which offers traditional style, location, value and convenience, in an outstanding setting. Low HOA fees. The Lakes has a private recreation center with pool and clubhouse with fitness room and small library. This is not included in HOA fee and membership may be purchased separately. Pool membership will convey with sale. The Lakes is conveniently located off Hwy 17 Bypass near Surfside Beach. Close to the beach, golf, dining, entertainment, shopping, medical facilities, Brookgreen Gardens, Wacca Wache Marina and Huntington Beach State Park. Square footage is approximate and not guaranteed. Buyer is responsible for verification.